In the past it was in some cases a hard task to setup a monitoring suite and get it running. Commercial and open source tools where not very user friendly and often lagging a good usebility. I remeber the early days of tools like HPOpenView and Nagios. Luckely times have changed and today you can have your monitoring up and running in a few minutes. I am a big fan of OMD and the Check_MK frontend developped by Mathias Kettner. I show you the steps that are needed to get OMD up and running. From the project download page you find packages for Debian/Ubuntu, RHEL/CentOS and SUSE. In my example installtion I used Ubuntu Server. So lets get started. Now we can start to install the OMD package that we have downloaded from the OMD homepage. After the installation the OMD commands should be ready to use. The first task is to create a omd site. The concept behind it is that you can have multiple sites on the same server so e.g. you can create a site network and a site server. The benefit is that you can do separations for different IT departments or locations. It is also always a good idea to create a test site. Note all OMD commands need root privlidges. 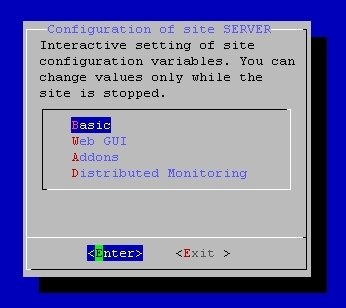 It is a menu based configurator where you can change the basic settings for your site. I use as the Default_GUI check_mk. If you like addtional addons you can also activate them here. I enabled here NAGVIS wich provides grphical maps and vsiulization for your monitoring and PNP4Nagios that provides grphical statistics. From this point you can configure all further settings from the web frontend. With Check_MK you have a powerfull gui that can be customized by the user. You have on the left side a so called snapin menu. With the button on the left down side you can add or remove snapins wich can gave you access to extra addons like NagVis or BI. Compared to the config file based configuration from the classic nagios this is much more easy to handle. Adding new hosts is also done very quick with the copy function from the gui. Once you have created a host it is possible to copy this host simple change the name , alias and IP address and you have a new system in the monitoring configured. From the hardware prospective OMD runs on very small boxes like a Rasberry Pi. Here it really depends how many devices and checks you are running on your server. Try out OMD distro and leave a comment about your impressions here if you like. This entry was posted in All, Howto, Monitoring. Bookmark the permalink. great to hear that we have the first vistor from Brazil on the networkautobahn. Thanks for posting this. I have tried OMD as well but feels that there are some drawbacks. When I used Check MK without OMD I was able to update with innovation releases in a quite easy way. It seems like there are only stable relaeses in OMD if you do not purchase support. Do you have any good way of keeping it up to date? Yes that is correct. OMD has only the stable versions, for the innovation releases you need the subscription. that to the costs of a commercial monitoring solution. First… I’m enjoying your blog, keep up the great posts! We are looking at monitoring solutions where I work, and I am curious if you have considered OpenNMS, and if so, what reason(s) did you select OMD and CheckMK over the OpenNMS? 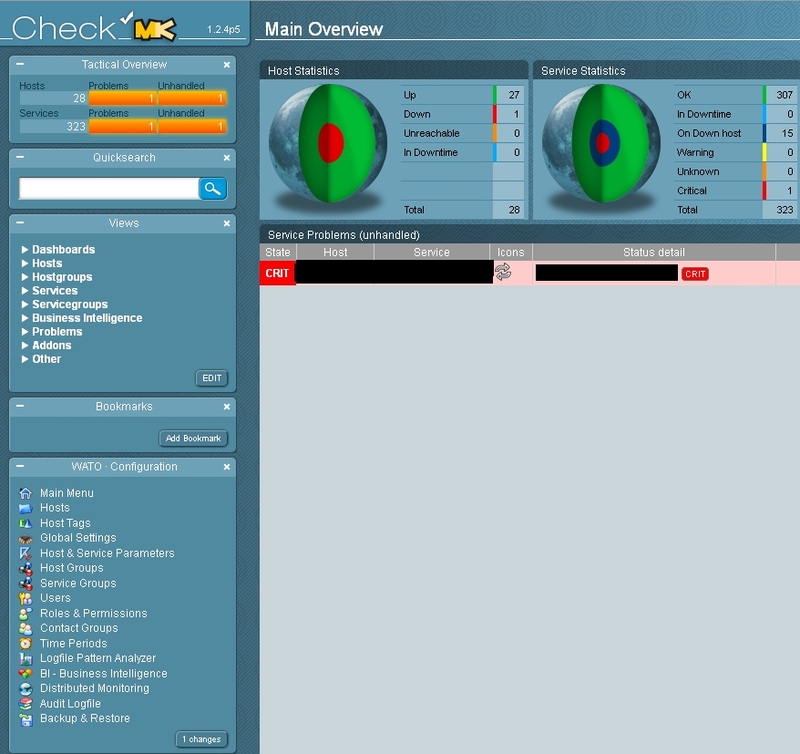 I have to admit that I haven´t looked very deep into OpenNMS, but one of the major benefits IMHO for Check_MK and OMD is the scalebilty and the level of integration of the web gui. Would be very interesting for me what is the better monitoring solution for you. Hello. I am using the latest version of check_mk 1.2.4p.5 but the emails are not working properly. I am getting maybe one email over a few days. Has anyone has this issue. Check_mk is suppose to be great but I am having doubts. Any thoughts? Zenoss, Zabbix, or perhaps a stable commercial monitoring product with support and good documentation. never had any issues with the mail notification of check_mk. an email alert in check_mk. There is also professional service available from the check_mk develloper Mathias Kettner. When you are looking for a commercial monitoring solution I would check out solarwinds. I am looking to install check MK into my system, and I have a few questions regarding it. Do you need OMD to use Check_MK? If not, how do I go about installing check_mk on my ubuntu server?